Today's post is all about the gift for graduation! Seniors in high school face a lot of pressure getting into college or securing what's next for their future. Similarly, college graduates face the difficult challenge of getting a job in our economy. Reward graduates who are close to you with something they'll love or will find useful in their next endeavor. More Than Paper has a wide selection of gifts for every budget. Take their photo on graduation day and insert it into a personalized frame with their graduation date for a wonderful keepsake gift. Treat your graduate to a monogram necklace -- so hot right now! Get your high school senior "dorm ready" with a personalized towel wrap, a monogram laundry bag, or hip monogram shower shoes/flip flops! We have lots more ideas from which to choose at More Than Paper. 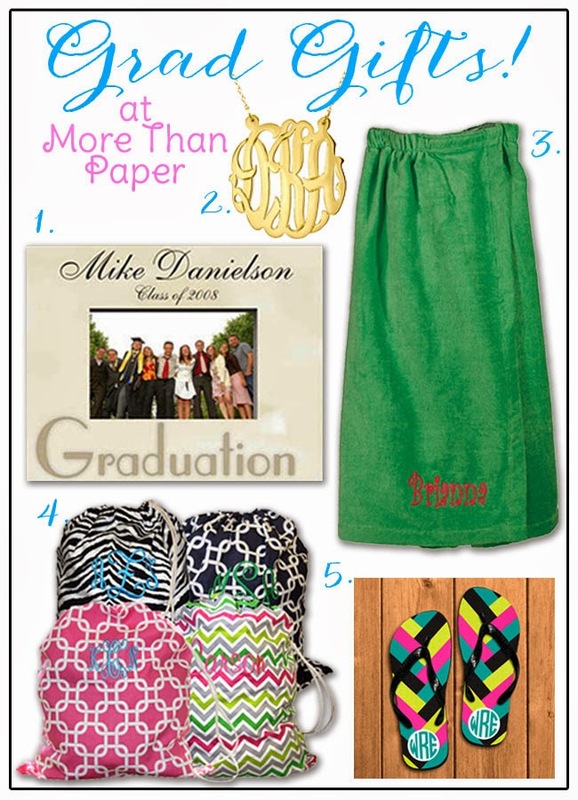 Head on over to shop our site now for these great gifts and plenty more for graduation!